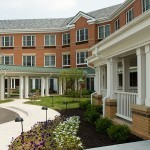 Sunrise Senior Living - Sunrise of Leawood - S. M. Wilson & Co. Sunrise Senior Living - Sunrise of Leawood - S. M. Wilson & Co.
Sunrise of Leawood is a new three-story, 85,878 SF facility that includes 82 residential units for assisted living and Alzheimer patients. 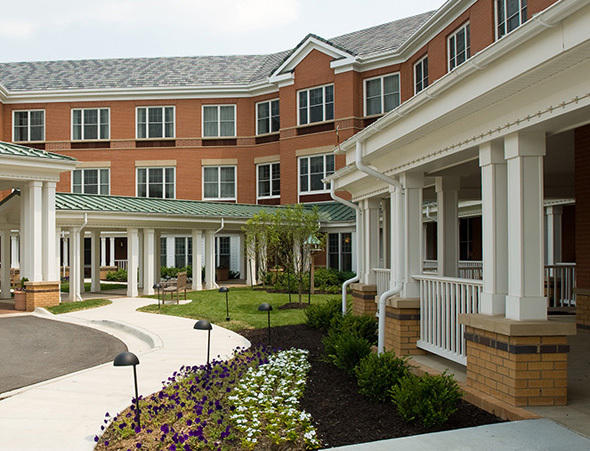 The facility features an elegant community dining room, a private dining room for family or guests, a 24-hour bistro, wrap-around porch and terrace, a sunroom and television and living room areas. The project also included an underground 75-car parking garage. Sunrise of Leawood is nestled on 2.8 acres that features lush landscaping, gardens and outdoor areas for the residents’ pleasure.